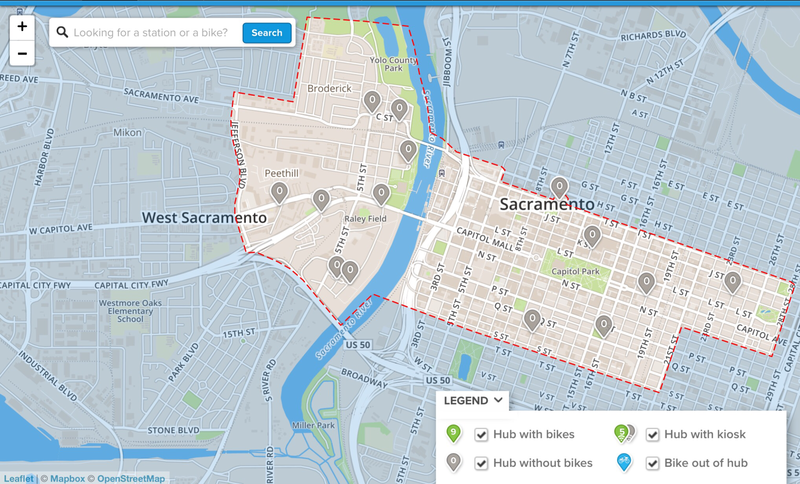 The SoBi (Social Bicycles) bike share system in Sacramento is about to launch. The bike racks have shown up on the ground, and just yesterday, on the map. SoBi is a kiosk-less system, unlike, for example, Bay Area Bike Share in which bikes can only be checked out from and returned to kiosks with racks that the bike are designed to lock to. SoBi will lock to any rack, anywhere, as it has an integrated U-lock. As the system opens in Preview mode, perhaps tomorrow there are 14 rack locations or hubs that will have a total of 50 bikes. The map shows the locations, and by the zero in every pin marker, you can tell there are no bikes there yet. This screen shot is from the browser app, but the mobile app is similar. The system is called Tower Bridge, which makes sense, because the preview is in West Sacramento and downtown/midtown Sacramento, linked by the Tower Bridge. In perhaps November the system will be expanded to go as far west as Davis and as far east as Sac State. There will also be some rack locations that look more like traditional kiosks, with information signs. 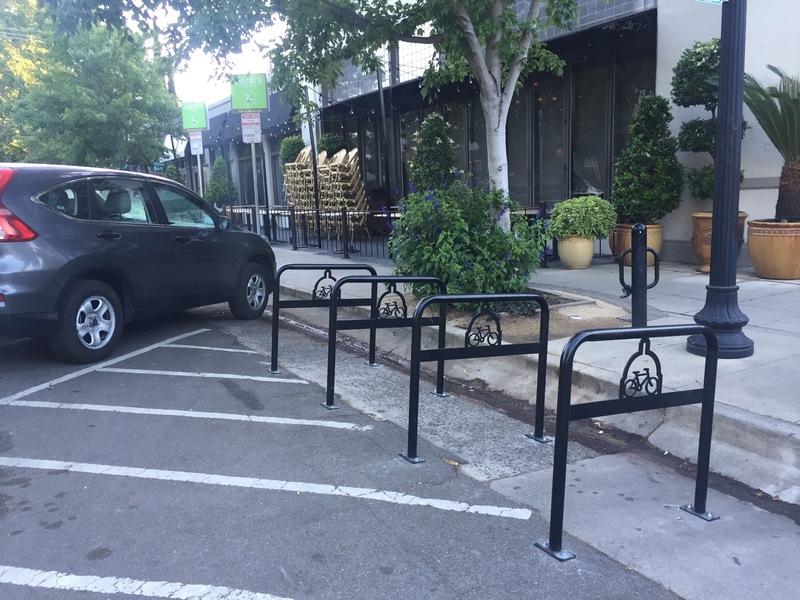 For now, the racks are just traditional bike racks, shown below. This location is on 18th St at Capitol Ave, next to Zocalo and the ZipCar parking spots. The other one in my neighborhood is across the street from the Fremont Park ZipCars, next to Hot Italian. These locations make sense to me, for multi-modal trips, part bicycling and part driving. I’ve already signed up and banked some money in my account. To be honest, I’m not the target audience for this bike share since I live in midtown and having a folding bike that I can take anywhere, rarely needing to park it outside. But I will try it out as soon as bikes show up, and will probably use it on occasion. At the moment, the only membership type is a timed charge, $4/hour, prorated, with no membership fee. The first 30 minutes free that some other systems use is not offered in this one. There will be other kinds of membership eventually. For more information, go to Tower Bridge Bike Share. Update: There are bikes in the racks, but they are not “live” yet, they can’t be checked out.